My name is Ron and I am located in Central NJ, not far from the Jersey shore (shoah as some pronounce it). 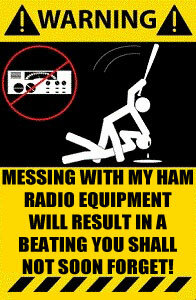 I became fascinated by radio as a small boy in the 1960s when a Ham moved in next door to me and my parents. He had some really cool stuff. He had a homebrew HF amp that was the size of a small refrigerator and had glass vacuum tubes in it the size of my head. He also had a big, old mechanical, working, teletype machine connected to a Heathkit transceiver... WOW! I was hooked from then on. He also had a couple of large telescopes which inspired me and my father to build two of our own large 'scopes. My first "rig" was a table top transistorized shortwave receiver with plug in coils for changing bands. I don't remember what brand it was but it was an AM only radio. I soon got my first transceiver, a one watt, two channel, CB walkie talkie that I had great fun with. Later I was given a 23 channel Realistic Navaho base station and put a CB antenna on the house. While still in high school I took the test and got my ticket (WB2KBI) and it's been down hill ever since... LOL. My first ham station consisted of a Johnson Viking 1 and an old Hammerlund Super Pro receiver. I worked a lot of CW back then. I also had a Regency rock bound 10 watt 2 meter rig that had three frequencies in it, 146.520, 146.910 and 146.940. There were two repeaters on 146.910 I could hit from the home QTH, one in NY and one in Toms River, NJ. As I usually was on the Toms River machine this became an issue with the folks on the NY repeater (this was before the days of CTCSS). The situation prompted me to build my first VHF antenna, a 13 element 2 meter yagi out of an aluminum pole and some heavy copper wire. It worked great, much to my surprise and I built many of my own antennas in the years that followed. During the early 80s my interest in ham radio waned somewhat as I became more imterested in women and cars. I had let my license expire but a good friend who had just gotten his ticket pushed me into renewing mine. Back then there was a five year grace period but if you let your license lapse for more than two years you were issued a new call. Thats how I ended up with N2FFL. 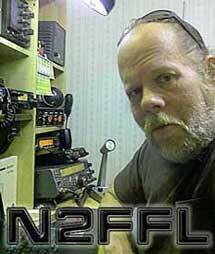 After I got my new call I became interested in 2 meter SSB and later 6 meter SSB and did most of my operating on those bands for many years. 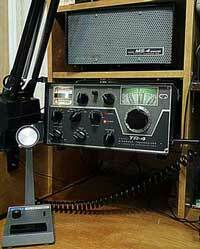 I got my start on 6 meters with a small portablr rig, the ICOM IC-502 (the rig to the left). I picked it up used at a hamfest as a cheap way of checking things out on 6. The 502 was a USB/CW only rig, produces a whopping 2 watts and has a built in telescopic 1/4 wave antenna. I never thought I'd be able to work anyone with it but was proven wrong. 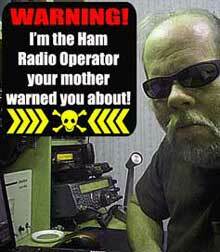 I worked plenty of stations and had great fun working 6 meter QRP with it. I no longer have the rig and it has been replaced by a Yaesu FT-817. Later in the 80s I aquired a Swan 250 and had great fun with that, even worked some AM stations on the west coast on 6 with it. In the early 90s I got married, collected more radio equipment and built antennas. Twelve years later I was divorced and found my way to southeastern Pennsylvania. I also treated myself to some new radio equipment at this time and picked up Drake TR-4 at the hamfest in Tinnonium, MD that I have only recently gotten on the air (only took me 6 years). While I was in PA I didn't have much time to play radio, had nothing set up in the house but did have my '94 Ford Bronco outfitted with a Kenwood TS-2000 and an Alinco DR-235 for the 220 MHz band. Unfortunately I just didn't have the time to get on the air much. Towards the end of 2010 I became disabled, lost the ability to drive and returned to NJ. The problem of not having the time to get on the air was solved at least! The rigs were removed from the Bronco, brought into the house and set up. Antennas were constructed and installed. I repaired my TS-2000 (bad driver transistor) and got it back on the air. The Drake TR-4 was finally put on the air after about 6 years and I obtained an Alinco DX-70 which I use primarily for monitoring 50.125 MHz USB. The Drake I am using primarily for AM operation on 75 and 40 meters. I monitor 50.125 MHz USB and 146.520 MHz FM pretty much continuously. I also monitor 7.290 - 7.295 MHz AM during the daylight hours and 3.870 - 3.885 MHz AM at night (when the static crashes aren't 40 dB over S9). You'll also find me lurking on 10 meters when that band is open.